Astrid thinks she’s a monster and hides the scars covering her body. 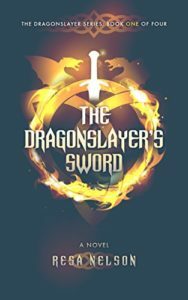 As a child she’s sold as to a blacksmith in a far northern town and meets DiStephan, a young boy training to be a dragonslayer like his father. The blacksmith teaches her how to use magic to hide her scars and trains her in his art. Astrid falls in love with the craft – and in love with DiStephan. Then one day, DiStephan disappears and a new dragonslayer comes to town, bringing with him change. But with the destruction of her village, Astrid starts to question who she is and where she came from, leading to a quest of self-discovery.